Guilsfield VillageGuilsfield is a treasure of a village just three miles north of the market town of Welshpool. It is a great place to base yourself for an exploration of the Mid Wales Marches and an even better place just to relax and indulge yourself. The Welshpool & Llanfair Railway is nearby, there is the Derwen Garden Centre on the doorstep and Lake Vrynwy is only a short drive away. There are a wealth of walks in the area to choose from including Offa's Dyke National Trail, Glyndwr's Way and the Anne Griffiths Way. The Welsh name of the village is first recorded in the 12th century as "Kegitua" and means "place of hemlock". The English name is first recorded in 1278 as "Guildesfelde". It may be named after a person - i.e. "Gyldi's field" or could mean "gold field". The village contains St. Aelhaearn's church which has a tower dating from about 1300. There are several large houses in the area including Maesmawr Hall which dates from 1692 and Trawscoed Hall from 1777. 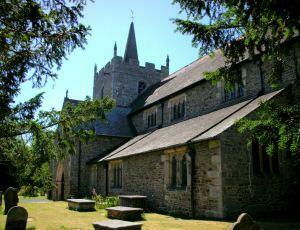 Guilsfield is a treasure of a village just three miles north of the market town of Welshpool. It is a great place to base yourself for an exploration of the Mid Wales Marches and an even better place just to relax and indulge yourself. In 1862, a hoard of metalwork from the late Bronze Age was discovered near the village. It contained over 120 pieces such as swords, spearheads and axes.